Friday, February 19, 2016, 7:30 p.m.
Saturday, February 20, 2016 7:30 p.m.
Sunday, February 21, 2016, 2:30 p.m. In keeping with the class reunion theme, the show will be performed upstairs in The Lewisburg Hotel, with reunion nametags for audience members and a cash bar available at the intermission of each performance. Friday and Sunday’s performances will be in the grand ballroom on the second floor, while Saturday night’s performance will be upstairs on the fourth floor in a more intimate space. Seating will be more limited for Saturday night’s show, and audience members are advised to purchase tickets early and be aware that only Friday and Sunday’s shows are handicap-accessible. 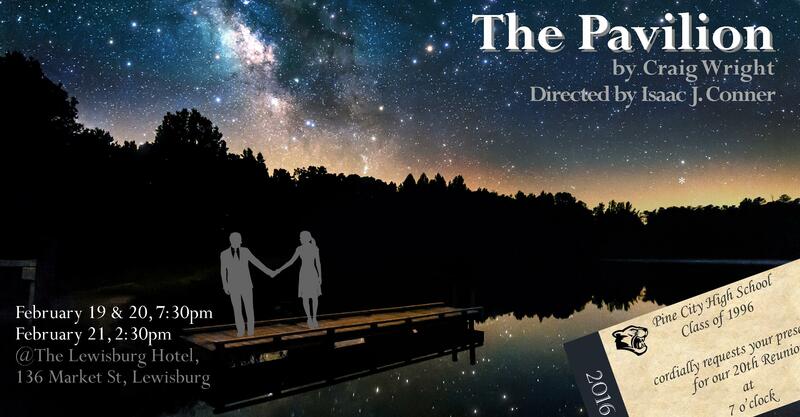 With a small ensemble cast and an intimate setting, you won’t want to miss this very unique, very special night of live theatre presented in the beautiful Lewisburg Hotel. Meet the Cast and Director!